When should you use medicated shampoo? When it comes to selecting the best medicated dog shampoo, there are a number of factors you need to consider. While researching this article we were shocked to learn that cheap low quality shampoos can actually cause more harm than good if you don’t pay attention to what chemicals are in the bottle. Medicated dog shampoos are ideal to soothe an itchy skin while fighting the bacteria, fungi, viruses, worms and parasites causing the problem. 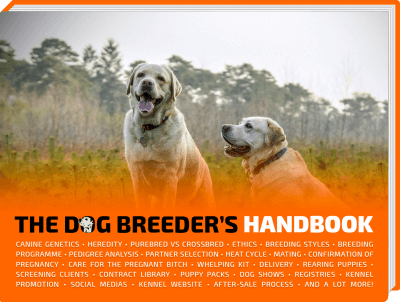 Here at Breeding Business we have done the legwork for you and reviewed a huge number of quality and safe medicated shampoos for dogs so we could shortlist the top 7 best antiparasitic and antiseborrheic dog shampoos. Our goal is to try and find the best vet-grade dog shampoo available over the counter for normal at-home use. If you have particular needs or a sick dog, you must consult your vet for a prescribed shampoo or antibiotic. During normal periods where your dog is totally healthy, shampoos are recommended only every few weeks depending on how dirty your dog gets. If your dog is showing signs of parasites or skin problems, we recommend two or three shampoos in that week to then see how things have evolved. If a full outbreak is present, you should consult a vet and wash your dog regularly (even daily) until then. If your dog has certain allergies to flowering plants then you may only need to wash your dog in the spring time. If you dog has consistent skin issues throughout the year and you can’t identify what is causing the outbreaks then washing your dog with medicated shampoo might have to become part of your weekly routine as a preventative to skin flare ups. However, in case of suspected dog allergy or intolerance, you should focus on finding out the guilty allergen(s) rather than washing your dog weekly. So without further ado, let’s get started with our review of the best medicated dog shampoos. We will be comparing the active compounds used in these different shampoos while also compiling hundreds of customer feedbacks and our own personal experiences and results. Remember that for serious skin problems, there is no point risking the wellbeing and health of your own dog trying to solve the issue with shampoo. The problem may be internal but symptoms external; therefore using a shampoo is not going to help. While the shampoo might be a little more expensive than the average product, I personally believe it is worth every penny. You do not become a bestseller on the leading e-commerce websites without ensuring the best quality consistently over the years. SynergyLabs shampoo is the standard shampoo used at the veterinarian clinic that was working with us throughout the test. 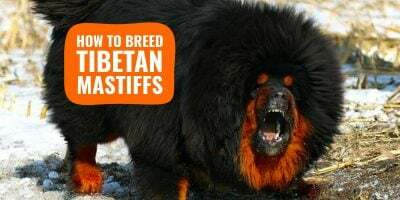 They have used it on a number of dogs and consider it the best over the counter medicated shampoo for dogs suffering from moderate to severe skin conditions. One of the only few downsides I can find with the product is the smell when used very regularly. It has a strong chemical smell that is not pleasant at all however after 2 weeks of using it there was definitely less skin inflammation on my dog and he was scratching his coat far less often. All in all I would still give this shampoo 5 stars. It was quick working and effective and it comes as no surprise that while researching it online we could find thousands of positive reviews. Featuring all-natural ingredients and without the strong chemicals that other medicated shampoos rely on Paws & Pals Natural Dog Shampoo was one I was looking forward to testing out. Made from all-natural oils including aloe, coconut and jojoba oils, this product is about as dog-friendly and environment-friendly as you can get. Not only is it great for your dog it is also great for the environment, its container is made from recyclable materials. There is no risk of harmful chemicals entering the waterways or lingering in your home. No animal products are used in the making of it (yes it’s completely vegan-friendly) but this is true of many shampoos generally. However, the real question was how did it stack up compared to other medicated shampoos that relied on chemicals rather than all-natural oils? First, applying the shampoos was far easier for me! When applying the shampoos made with stronger chemicals the experience often left me slightly lightheaded. And without a backyard to do the washing, I have to do it in my apartment which at times may start to smell like the laundry section of a supermarket. This product however smelled great. A mix of almonds and something I couldn’t quite put my finger on. The twice a week application felt much less like a chore and more like a bonding session with my dog. As for the results: there was definite improvement in the skin irritations that George had at the time, although not quite as drastic as some of the other chemical based shampoos. On a side note, though his coat softness and smell was better than I have ever seen though. I think I’m going to start using this shampoo throughout the year just to keep his coat looking and feeling like it does now. I think all-natural products are not conceived to make miracles happen after one use or two, they win marathons, not sprints. The third item on our list is Sulfodene Medicated Shampoo. With a number of good reviews online this product relies a little more on chemicals to treat your dog’s itchy skin and parasites in comparison with the abovementioned all-natural shampoo, but a little less aggressive than the Synergylabs’ product. The main issue I found while using this medicated shampoo is the application. Let me explain. 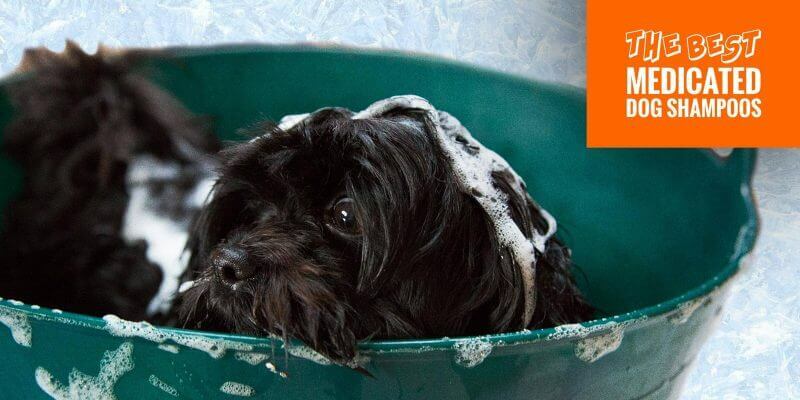 It is recommended to leave the shampoo on your dog’s skin for up to 10 minutes before washing it off. My friend struggled trying to keep her dog still for it to be effective. 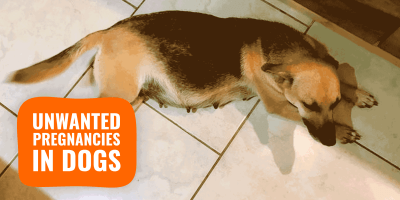 If your dog is a little less restless than hers is, then this should not be an issue at all. This shampoo is clearly boasting chemicals in its list of ingredients but they seem less concentrated which makes for a less aggressive product. Additionally, Sulfodene is a conditioner, too. Meaning, it moisturizes the skin to avoid dryness while also using chemicals to try and solve the underlying issue. All in all, I think this is a good middle ground between oil-based natural shampoos and chemical-based medicated shampoos. 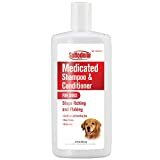 This item on our list is the American-made antiseptic and antifungal shampoo conceived by Pet MD. Everybody knows PetMD the website offering veterinary-grade articles on various medical conditions affecting our pets. They know their spiel so well that they started to produce and sell their own medical-ish products. This shampoo is on the expensive side when compared to all the top products falling in the same category. This is also true when compared to the other products we’ve rated here. The price is probably inflated because Pet MD receives millions of visits so they can afford less volume and a higher price tag. Yet, its results on yeast and bacterial infections are outstanding so around $20 a bottle may actually represent a bargain and no-brainer. If my dog had a bad yeast infection this would be the first medicated dog shampoo I would buy. With so many 5-star reviews all over the web, this is a product every dog owner should have in a closet, just in case. The shampoo has a flowery smell but you can definitely still pick up the faint smell of chemicals underneath. During a breakout it may be necessary to apply the shampoo up to 3 times per week so you can expect to go through the bottles rather quickly if you have a large dog. In discussion with some dog health experts, they suggested using Dechra DermaBenSs or a similar product at least once a week if you dog is prone to seborrheic flare ups as a preventative as well as a cure. Most reviews mention how, after just a couple of applications, dog owners noticed the little bumps started to disappear from their dogs’ skin. Dechra DermaBenSs also reduces dandruff in dog coats! According to our tester-in-chief, the chemical makeup of this shampoo is excellent for dogs that suffer from dermatitis, demodectic mange and canine acne. Or, for dogs who are prone to developing these conditions. It also contains moisturizing lotions which can help with dry and itchy skin. When applying Davis Benzoyl Peroxide, you also should let it rest on your dog’s coat for 5 to 10 minutes before rinsing thoroughly. Because of the smell, your dog might want to move around or lick it: invest in a cheap elizabethan collar to avoid your dog ingesting chemicals. One downside I noticed is that the shampoo was quite hard to lather so I don’t see a bottle lasting very long. He used almost a third of the bottle in just one wash, and his dog is medium-sized. It is listed as being safe for use with puppies however we would not recommend experimenting with pups, so triple-check with your vet, even if just over the phone. Any solution that encourages you to wear gloves is probably not good for a tiny puppy’s health or wellbeing. The ingredients work well as a preventative and the moisturizing components would leave your dogs hair looking and feeling fresh and shiny. The shampoo has some helpful active compounds, like Chlorhexidine and Ketoconazole, that would reduce and potentially remove some stubborn skin problems that can be found on dogs. Another positive note was the cucumber and melon smell that the shampoo gives off. It does not smell like the strong chemicals it contains at all, and the dogs we were washing with the shampoo did not seem to mind at all. All in all the products above all had some level of success for most of the customers who bought them. 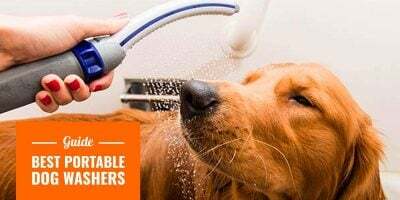 These are the top-rated medicated dog shampoos currently available so it makes sense that they have found the right formula and active ingredients to fight off a particular group of skin diseases. For suspected mild skin irritations, we would recommend you to start off with the all-natural Paws & Pals dog shampoo. It should solve your dog’s problem without harsh chemicals and without a weird smell. The natural oils used in it are great for dog’s follicles and can fight off dandruff too. For moderate and severe skin conditions, you would need to figure out what exactly is happening: mange, parasites, dermatitis, yeast infections? Once you figure that one one, pick the most appropriate medicated shampoo from the list above. If you are completely unsure and the skin is not yet too damaged, go for an all-around great antiparasitic and antiseborrheic dog shampoo like the SynergyLabs veterinary-formulated shampoo. 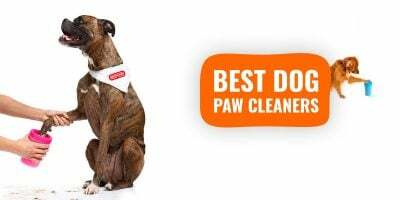 Thanks for the help with this article to Evan Yore from Connect Cleaners, an Australian company specialized in the use of non harmful pet friendly cleaning supplies. Thanks for this! Medicated dog shampoos are very effective and pretty much saved my dogs lately.